Welcome to the Trophy Transportation blog! For those of you who are not familiar with our logistics and freight brokerage company, we have been a trusted partner for the nation’s backbone industries for over a decade. We’re best known for providing logistics solutions and the safe transport of oversized and heavy-duty industrial equipment. For our first post, we thought it would be beneficial to cover what exactly working with freight brokerage companies entails and the reasons that partnering with one can make running your operation easier. This way, you can focus your efforts on your core competencies and leave streamlining the rest up to companies like us. For starters, let’s dive into what exactly freight brokerage companies do. What Does A Freight Brokerage Company Do? Freight brokers assist shippers with freight that is ready to haul, whether it is heavy equipment, products, or materials, by connecting shippers with reliable local carriers who are qualified to haul the load from point A to point B. Freight brokers are responsible for orchestrating deals with shippers, planning out the logistics, and then facilitating the movement of a shipper’s freight throughout the entire process. They are responsible for keeping an open line of communication with the carrier in order to consistently update the shipping company on the status of their haul. By providing these freight services to companies, it makes it easier for them to find quality carriers that are proven to be reliable in hauling a load. Most of the powerhouse companies that we work with at Trophy Transportation in the oil, gas, construction, mining, and other industrial industries don’t have the experience or time to determine if a carrier is qualified to perform the specific tasks that they need completed. Sure, most trucking companies are consistent and deliver a load in a timely matter with nothing to dispute, but there are some bad apples that make it difficult to be certain your expensive equipment can be trusted in the hands of a stranger. This is where freight brokers come in handy. Additionally, freight brokerage companies help motor carriers that are professional and reliable potentially earn more by having readily available loads to haul. In this way, the freight services provided by companies like Trophy Transportation and others help keep businesses running smoothly, getting more work done in less time and keeping people employed. Why Work With A Freight Broker? So why should you use freight brokers? There are many reasons as to why utilizing the freight services of a third party logistics company is helpful, but the most commonly referred to reason is efficiency. Efficiency plays a crucial role in keeping a business thriving, so why not take advantage of the advantages a freight brokerage company has to offer you and your business? 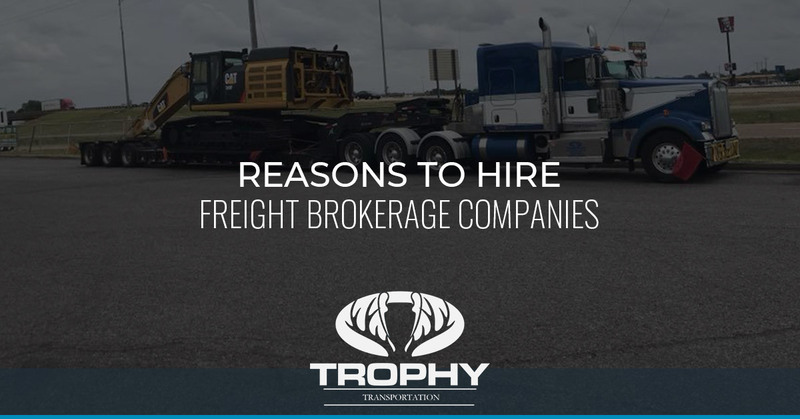 If you’re still on the fence on determining if hiring a freight broker is right for you, the following are four additional reasons you can benefit from the use of a freight brokerage company like Trophy Transportation Company. By taking advantage of the freight services provided by freight brokerage companies, you receive all of the perks of having an in-house shipping department without having to invest the time and money into installing and running the operation. You can avoid all of the costs of invoices, audits and training as well as reduce the amount of overhead costs from purchasing the required equipment, buildings, and computer systems. In addition to these reductions in business expenses, freight brokerage companies can also find you ways to limit the cost of the shipping itself. The knowledge and contacts that freight brokerage companies have gathered over years of experience in the industry allow them to lock in lower rates than you would receive as a one-off shipper. Depending on your businesses specific needs, a freight broker can provide you with more or less capacity throughout the different business quarters. This means less stress throughout the seasonal demand spikes and lows your company experiences. Transportation is what freight brokers do best, and working with one gives you access to their knowledge of best practices and real-world experiences. Trophy Transportation keeps up to date with the most recent shipping technology and ways to constantly improve their efficiency. Freight brokerage companies are your one stop shop for all transportation needs. Lastly, hiring a freight brokerage company builds a partnership. We work for you, meaning our priority is putting your needs and interests first. When you succeed, we also succeed. Our business grows when your does, so we do everything in our power to streamline your freight transportation and help you grow. It’s our job to make sure each of your shipments gets from A to B, hassle-free. If you have more questions about our freight brokerage services, feel free to reach out to our team of freight brokers at Trophy Transportation today. You can even request a quote online, and we will promptly respond to you with a custom quote for your business’ specific transportation needs.